Extensive hard rock mining first for copper and then for gold started in Soledad Canyon by the Santa Clara River near present day Acton in 1861 and continued off and on until the early 1950’s. Most of the gold ever recovered in Los Angeles County came from the Soledad Mines. A detailed history of the mining is contained in John Robinson’s The San Gabriels. Unlike other local mines most of the major mines are shafts going down hundreds and even thousands of feet and are now sealed. They are all on private property outside of the Angeles National Forest but are not posted. Former California Governor Henry Gage (1899-1903) and later his son Francis owned many of the mines. Governor Gage owned the New York (named after his native state) and later renamed by his son the Governor in honor of his father. It produced more gold than any other LA County mine. It goes down 1,000 feet with a number of horizontal levels. After one fatality (the body was never recovered) and several rescues the mine is now thoroughly sealed. From the Antelope Valley Freeway go north on the Governor Mine Road for about a mile just before it ends. The mine ruins up a hill to the left are quite apparent. The Red Rover (named by Governor Gage for his dog) goes down 600 feet and is also sealed although there are two contiguous horizontal passages totaling 166 feet at the top that can be safely walked through. Both mines have streets named after them, see Ritter Ridge topo. Drive north from the freeway on the Red Rover Road for a half mile and turn left at the first street with a white fence. Stop after a quarter mile when the dirt road gets bad and continue walking up the old road for about another quarter mile until you see the fenced in shafts. Going east on the Antelope Valley Fwy take the Soledad Canyon exit and continue east for 3 l/2 miles until nearing the tunnel. Just before the tunnel take a right on Capra Rd which continues a short distance until reaching the Santa Clara River. You will see a conspicuous mine entrance on the other side of the river. According to a state geology map this is the Bear Canyon Mine. It goes straight in for 176 feet .There are two shallow exploratory digs a couple of hundred feet to the west. An old road now a trail extends above the mine for several miles ending at Magic Mountain several thousand feet above, The writer does not know the history of this mine. Going east on the Soledad Canyon Road about a mile past the old mining town of Ravenna (Acton topo) there is a large Thousand Trails RV campground to the south. At that point drive north for several hundred feet on an unmarked dirt road. The road soon turns into a trail but walking up the trail for half a mile will get you to the prominent mine opening. This is the Emma first mined for copper around 1900 and occasionally worked since that time. It has one passage which goes 312 feet. It is presumably named after Mount Emma, a few miles to the east. 200 feet to the left of the entrance is the “ Emma Annex” which after an entrance crawl opens up with two walking passages totaling 278 feet A hibernating bat and numerous mice were found inside. The topo , comments from neighbors and personal investigation indicate there are other mines in the immediate area including a shaft about 25 feet deep a half mile northwest of the Emma which has not yet been explored. About two miles west of the Red Rover Mine Road on the Escondito Canyon Road is the Puritan Mine Road which goes north to the Puritan Mine (Ritter Ridge topo). The mine reportedly had two shafts (140 and 65 feet) which are now completely filled with dirt and gravel. 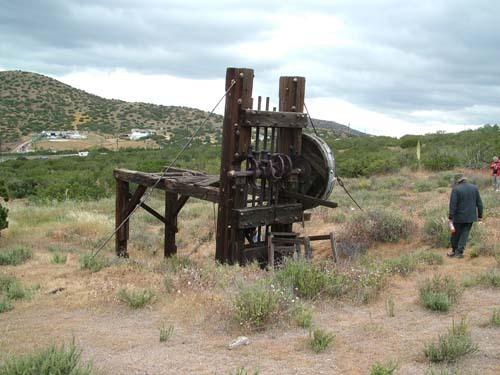 However what does remain in plain sight from the freeway in the middle of an open field is a well preserved 5-stamp mill dating from the 1880’s. This is one of only two upright stamp mills remaining in Los Angeles County. 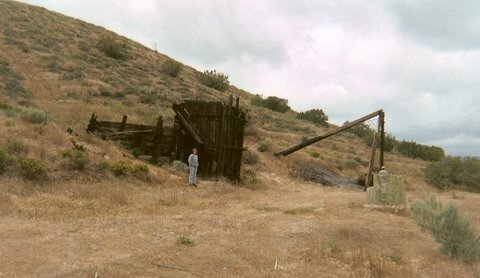 The other is a 2-stamp mill at remote Eagle Mine near the summit of Iron Mtn below San Antonio Ridge. two mills that remain standing in Los Angeles County. Near Agua Dulce on Sierra Hwy about two tenths of a mile north of the intersection with Davenport Road on the right hand side (east) and about 40 feet off the road is a sealed mine entrance. A local resident advised the writer he had gone into the mine a few feet as a child in the 1950’s and it was sealed a few years later. 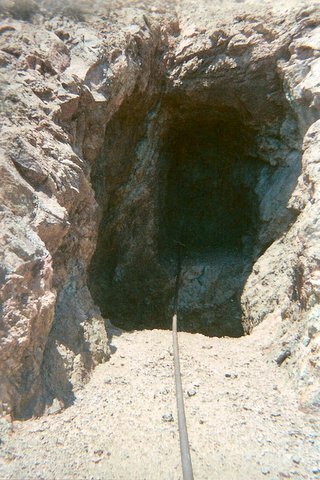 He stated there were several other sealed mine entrances in the immediate area. At this time nothing is known of the mine or its history. This is a preliminary study of the mines in the Soledad area. Much work remains to be done.